Halloween can be one of the most fun festivals of the year, but it often presents challenges to parents trying to foster a meaningful relationship with holidays. Add to that the current traditions that include so much candy and a sense of being “owed” treats and a family might want to sleep through October 31. There are ways, however, to bring meaning to Halloween. It shares qualities with traditions across many cultures that can inspire you to bring your own reason to the festivities. So whether you choose to honor your ancestors and commemorate the dead or just treat it like a harvest festival, you can find a way to meaningfully involve your children is all the Halloween happenings. Pumpkin carving– Pumpkins were originally carved to frighten evil spirits on All Hallow’s Eve. This night was seen as the beginning of the dark half of the year, and more souls were thought to be wandering the world. This lantern was supposed to protect the one carrying it. Personally, I would struggle to carry around even a small pumpkin, but the first jack-o-lanterns were actually carved turnips. To prepare for pumpkin carving, move everyone outside if you can. The mess can be much easier to clean up if most of it lands on the grass or you can hose off a picnic table. We always had a couple of permanent markers on hand. This allows the carver a chance to think before they begin wielding the knife. Children might appreciate a few inspirational pictures or prompts. Give them ideas about scary, funny or friendly faces. You might suggest eyebrows or ear holes for different features. Once they’ve drawn the face they want, help them cut open the top and scoop out the seeds. Save the seeds for roasting or planting or offer them to the birds. Then, they can use a serrated knife. Those pumpkin carving kits do actually work pretty well for the younger artists, and they are less likely to hurt themselves. Popcorn Balls– Find a treat food you feel good about offering to trick-or-treaters. Depending on where you live, homemade items may or may not be welcome. Popcorn Balls are popular in our area, as children only get them around Halloween; people get creative in flavoring them, so our kids might end up with a few different sorts of popcorn treats. If homemade is not possible, think of a few non-food items like fun pencils, stickers, tiny plastic animals, etc. Most trick-or-treaters will be delighted to have something besides candy once they are surveying their booty. Games– Hosting a few friends for Halloween can create a tradition for your family that’s different from the normal trick-or-treating. You could bob for apples; I prefer the version where the apples are hung by a string and the competition involves eating the apple without using your hands. Having costume contests might be fun depending on the age of the participants. Another idea is to have the guests all bring dress-up pieces that everyone then shares to create their costume on the spot. You might be surprised at what kids come up with. In our house, the favorite costume was the turtle fairy, combining three different pieces from garage sales and friends’ dress-up bins. Festivals and traditions build memories and mark the turning of time for children as well as adults. When we can bring our enthusiasm and attention to the celebration, we make warmer memories for everyone involved. 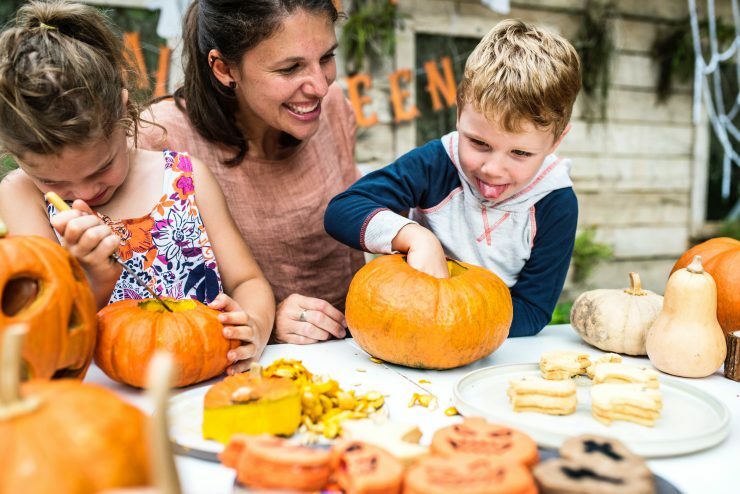 < 10 Outdoor Autumn Activities To Do with Your Child	> What’s Cookin’?